1819-1867 Andrew Guyse Kinsman, M.A. 1867-1885 Charles Henry Gibson, M.A. 1890-1895 Hugh Albert Claxton, M.A. 1906-1908 Charles Sydney Hawken, B.A. 1911-1915 Claude Hamilton Roe, M.A. 1915- 1919 William Edw. Colville Barrett, M.A. 1939-1959 Eric William Winter, L.D. 1971- 1982 Dennis Barraclough, S.Th. In the early 1100s, King Henry I granted dominion of the ancient parish of Batley to the Nostell Priory, located close to Wakefield. In 1233, a dispute between the Priory and the parish of Leeds over the northern boundary of Batley parish resulted in Batley's northern border being fixed at Farnley Wood Beck running between Farnley Wood and the assart of Gildus (Gildersome). At that time, Gildersome's population was probably less than one hundred. It took almost 650 years for the population to grow to over 3000, with two thirds of the growth occurring in the last 150 years. 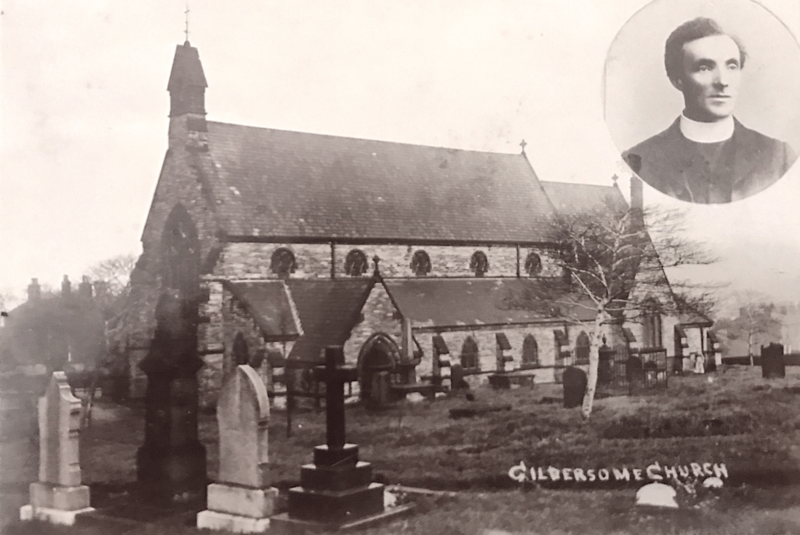 In 1870, after the death of its curate for life, Gildersome became an independent parish within the Diocese of Ripon. 1787 The first St Peter's built. 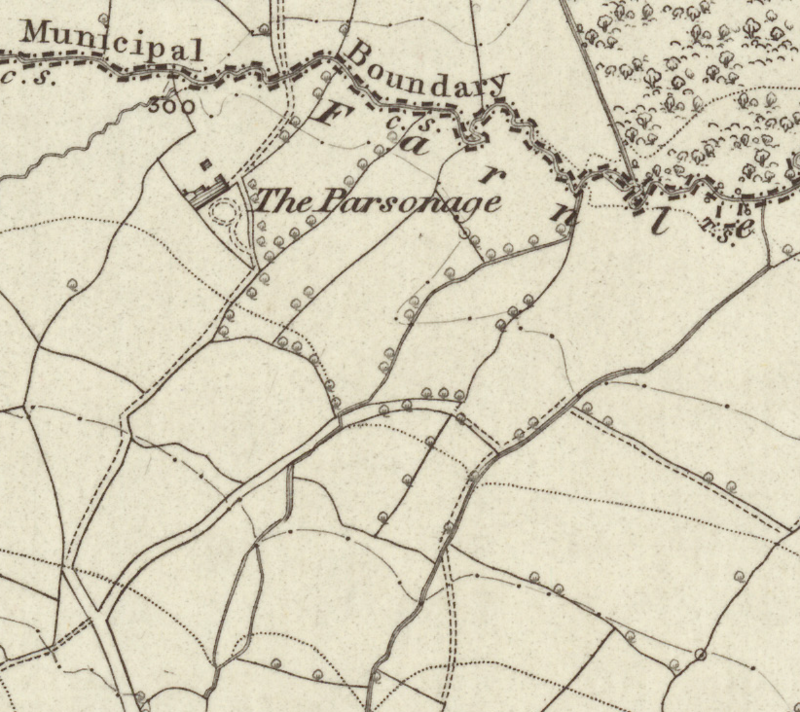 1793 Nova Scotia purchased, called the Parsonage. 1796 May 22nd First burial. 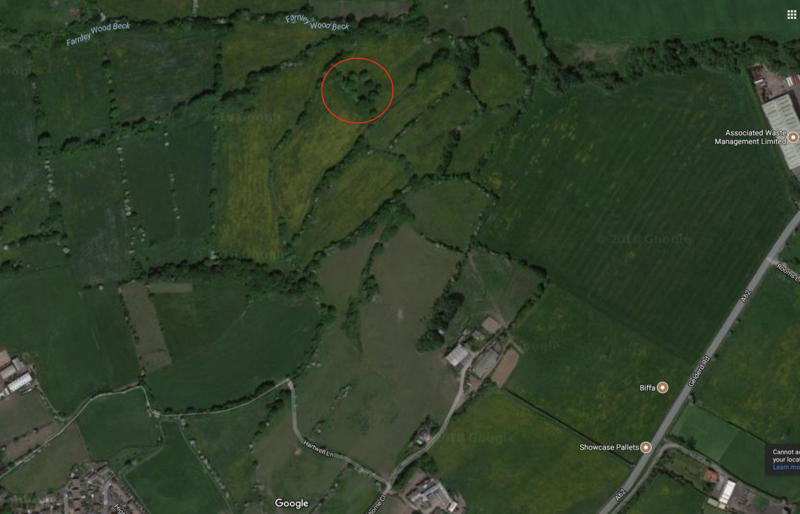 ​1802 23 Acres of Glebe land purchased in Tollerton. 1834 Value of benefice £104. 1840 Cardigan gift of land for school. 1858 13 Feb Parsonage attacked by burglars. ​1872 New Vicarage constructed on Street Lane. 1873 Feb. 15th Church destroyed by fire. In the latter half of the eighteenth century, it was noticed that Gildersome's growing population needed its own place of worship. Traveling to and from Batley parish church for every function was a roundtrip journey of eight miles over rutted, pitted and ofttimes muddy roads. by 1774 it was decided that a Chapel of ease be built on the same site as today's St Peter's (Wikipedia defines a chapel of ease as a church building other than the parish church, built within the bounds of a parish for the attendance of those who cannot reach the parish church conveniently). But it was not until Aug 29 1787 that the chapel was complete and the Curacy of Gildersome created. Apparently, most of the construction costs were borne by Mr. Turton of New Hall (Turton Hall) and Mr Sharpe of Sharp's House (behind today's Karen's Pantry). The first St Peter's after the fire. Taken from the cemetery. Taken from Church St. The old church school can be seen to the right. 1800 Enclosure of Gildersome Plan (WYAS Leeds). Click to expand. 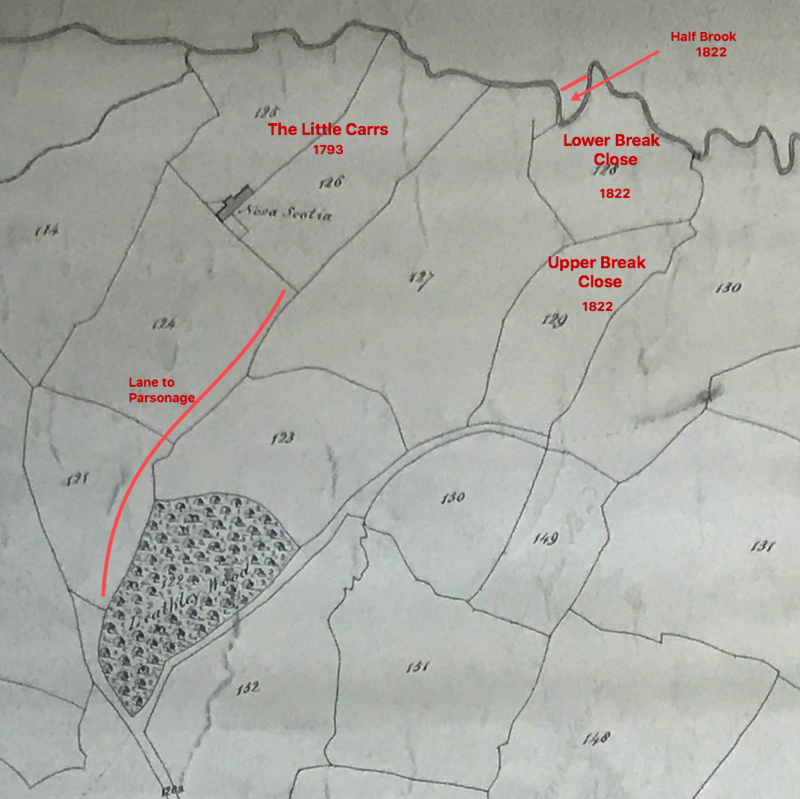 Above: Ordnance Map 1852, covering approximately the same area as the 1800 map. "The first entry of baptisms at Gildersome Chapel is March 3, 1795, and the first burial at the same chapel is May, 22 1796." In 1819, an indiscretion made while posted to the parish of Shrewsbury resulted in the Reverend Andrew Guyse Kinsman's appointment to the "much smaller responsibility of "Minister in Charge" of the chapel at Gildersome, where he was later confirmed to the somewhat unusual role of Perpetual Curate." (6) Kinsman paid for his mistake with 48 years of faithful service and became one of St. Peter's best loved, and its longest serving minister. By 1858, The Parsonage had been occupied for 39 years by Rev. Andrew Guyse Kinsmen. It was then that an armed burglary occurred there that gained nationwide attention for its brazen ferocity. The details of the incident are described in another page: “The Recent Daring Burglary at Gildersome Parsonage". 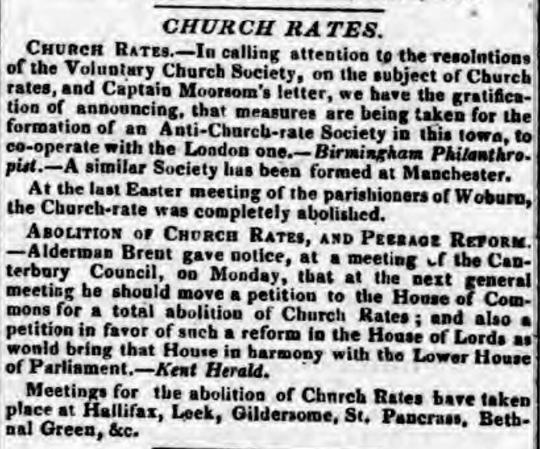 Church rates were set by the churchwardens together with the parishioners, who were duly assembled after proper notice had been posted in the church vestry or the church........The church rate was a personal charge imposed on the occupier of land or of a house in the parish, and, though it was compulsory, much difficulty was found in effectually applying the compulsion. This was especially so in the case of Nonconformists, who had conscientious objections to supporting the Established Church; in Ireland, where the population was mostly Roman Catholic, the grievance was specially felt and resented. The objections of the Nonconformists were not only on principle. The Church of England received financial support from Parliament, while Nonconformist congregations were entirely dependent on voluntary contributions. They did not want to have to support another parish as well as their own. "Gildersome, Oct. 16th, 1836 - Notice is hereby given that a town meeting will be held in the Church Vestry, on Thursday the 20th inst., at eleven o'clock in the morning, to determine upon the propriety of a voluntary rate for the use of the Church, and on matters connected herewith." ​The "voluntaries" were greatly outnumbered and the motion carried. By not allowing discretionary contributions and applying force instead, the churchwarden's actions poisoned an already turbulent situation and in the end, probably didn't receive as much as a farthing. This meeting made the London papers. As can be seen in the newspaper clipping, above right, little Gildersome received nearly the same attention as many larger town around the country. So on it went, the bitter recriminations continuing until the repeal of the compulsory rates in 1868. Frankly, the incidents are too numerous or too embarrassing to mention. My own relation, James Bilbrough, was dragged into court and ordered to pay arrears, but like his and every similar case that came before the magistrates, enforcement lacked resolve. It's doubtful whether any of the outstanding rates from Gildersome were ever recovered. The above excerpt illustrates that when a noncompliant church rate payer was brought to court, the charges were dismissed on the slimmest of technicalities. ​On the 24th day of May 1840, an indenture was signed by James Thomas Brudenell, 7th Earl of Cardigan, of the first part and Matthew Stephenson the younger manufacturer, Robert Elam civil engineer, Robert Smith Gentleman, Andrew Guyse Kinsman incumbent, Thomas Stephenson manufacturer and Isaac Mitchell farmer of the second part (all of Gildersome the latter two being Churchwardens). The indenture was the Earl's gift and granted the Church of England title to approximately 2400 square feet of (the Lord's) waste fronting Church Street and abutting the Church yard to the east (see diagram). According to some sources, St. Peter's Sunday school had occupied the space since 1837, if so, it must have been with the approval of Lord Cardigan. I believe the reason for the title change was purely a benevolent gesture on the Earl's part, probably at the urging of Lady Cardigan. Whatever the motive, the Sunday school continually operated for sixty years until in 1897, when a new Church school was erected. 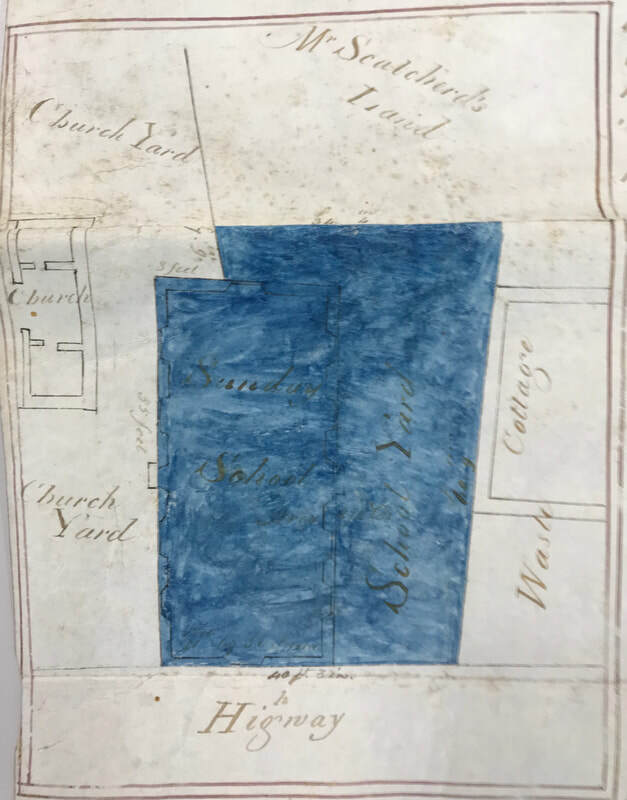 (Top right) The plan, included as part of the 1840 deed, shows the deeded parcel in blue. The school building is actually depicted as existing and can be made out in the left portion of the blue area. A rough floor plan of the Church tower can be seen on the left edge. The Brudenell crest (middle and bottom right) consists of a white shield, a red chevron and three blue pointed caps. 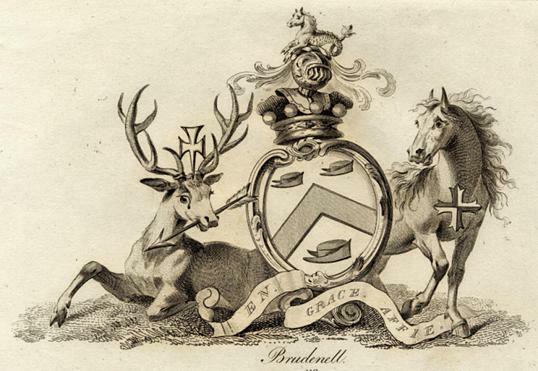 The motto "En Grace Affie" translates as "Trust in Grace"
The Brudenell Crest from a 1790 engraving. 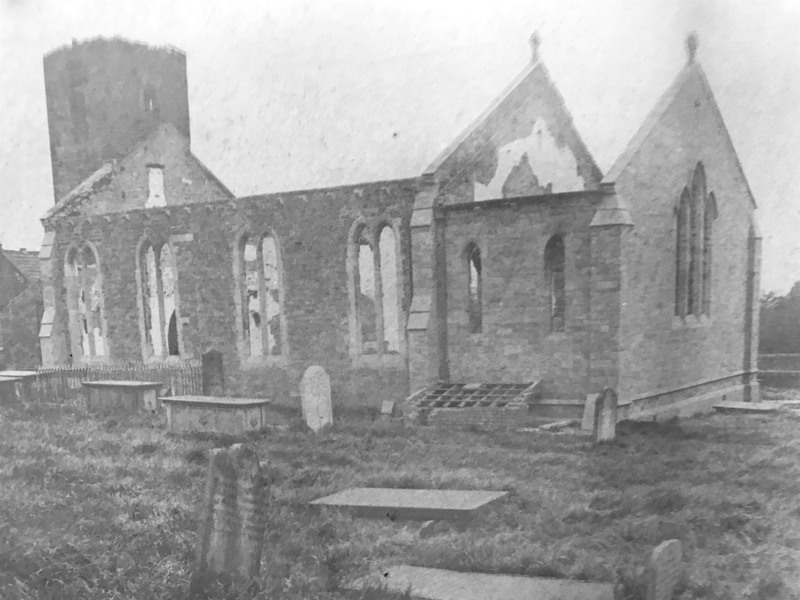 "DESTRUCTION OF GILDERSOME PARISH CHURCH BY FIRE. The parish church of Gildersome, a village about five miles from Leeds, has been entirely destroyed by fire. In the early hours of Saturday morning several of the residents perceived a smell like that of burning wood, but it was faint and did not excite such apprehensions as to disturb their usual rest, until an alarm was shortly afterwards raised that the church was on fire. This discovery was made about four o'clock by a carter, who was driving from Pudsey. He gave immediate information to Constable Shackleton, who hurried to the vestry, for the purpose of securing the safety of the registers. These valuable books and documents were, however, out of danger, being kept in the parsonage. After satislying his first anxiety, the policeman saw at a glance that the flames had already taken too great a hold upon the body of the church to be subdued. Even had it been otherwise, there were no means within easy reach of extinguishing a large fire; but of course this absence of such appliances need be the less regretted in a case where their use would certainly have been of little or no avail. It was several hours before the fire had spent itself, for it did not die out until everything that would burn had been consumed. Among the first to arrive at the scene was the minister of the parish, the Rev. C. E. Gibson, but he at once saw, as did also those other friends who quickly gathered round that it was hopeless to save anything from what had long been their place o [sic] worship. When one of our reporters saw the place on Saturday forenoon the church was a complete wreck. The roof had fallen in, and nothing remained but the four bare walls, a damaged portion of the tower, and some rubbish which was still smoking and smouldering. 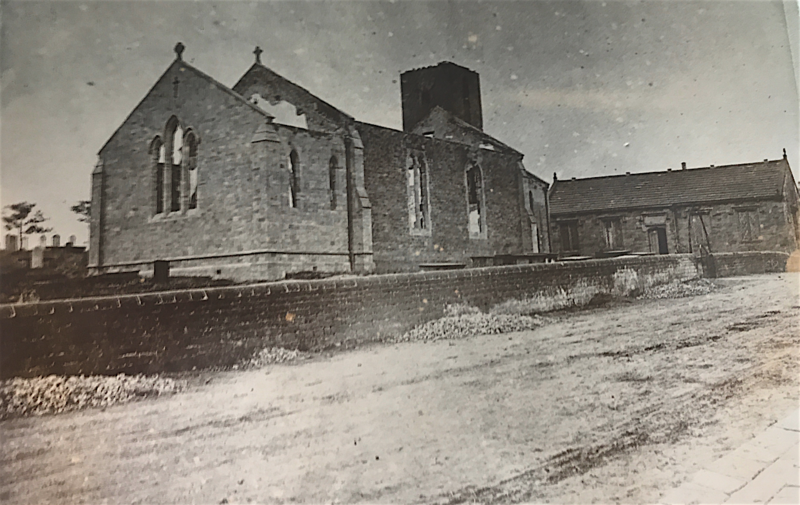 The regret naturally felt at the destruction of the church is increased by the fact that it had been reopened only in August last, after improvements which cost about £1,100. This sum had been almost entirely raised, although with some difficulty, among the parishioners. The church itself, which was not insured, is about a century old, and provided accommodation for 400 persons. 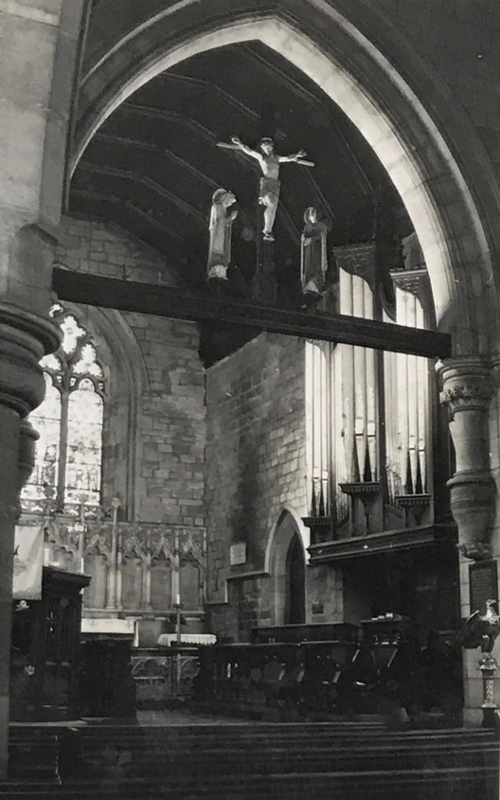 Among the recent alterations were that of adding a chancel, getting a new organ worth about £200, reseating the church with pitch pine, reflooring some portions of it, fitting up a new pulpit, and also a stained glass memorial window, the gift of Mrs. Stephenson and family. It is a rather fortunate circumstance that a new altar rail, promised by Mr. Ward, of Churwell, had yet been put in its place, and may therefore be available for the new church which will doubtless be built in place of the one that has been so suddenly destroyed. 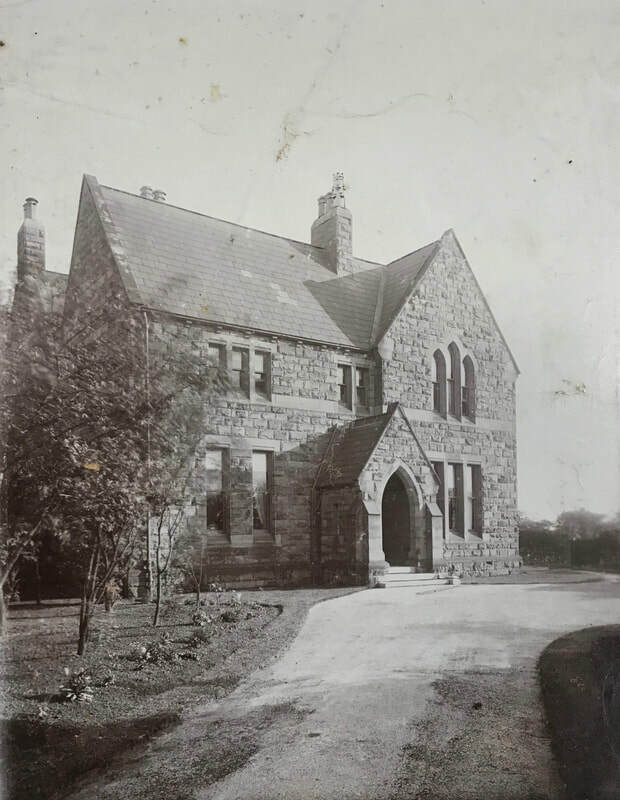 An encouraging commencement has already been made with the fund for its erection, Mr. W. J. Armitage, of Farnley, having kindly promised a contribution of £250. Other friends who visited the scene of the disaster on Saturday and yesterday also expressed willingness to give practical proof of their sympathy with the minister and parishioners of Gilderseome in their misfortune. The cause of the fire is not known, and is not now likely to be discovered with any degree of certainty; but the supposition seems to be that it originated with a gas stove which had been used to prevent the new organ becoming damp." On the mornmg of the 15th of February, 1873, Peter’s Church, was totally destroyed by fire. Erected a little over a century before by means of the Sharp family, the ancestors of the present of Vicar of Horbury. .........(description of the old church here, covered above)........... No time was lost In taking measures for the erection a new church in place of the old. 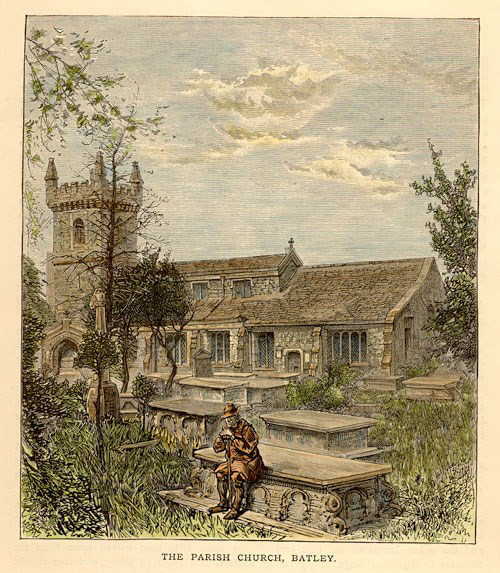 On the day of the fire Mr W. J. Armitage, of Farnley, visited Gildersome, and headed a subscription-list by a gift of £250, and on the following day a not despicable sum was dropped into boxes, which had been affixed in the churchyard, by persons who had gone to visit the ruins. Further encouraged by the assistance of members of the congregation and friends at a distance, active steps were taken by the Rev. C. H. Gibson, the vicar, and the Building Committee, which resulted in the commencement of an entirely new edifice in 1874, it being deemed necessary, to ensure safety, to pull down the old walls. The corner-stone of the new church was laid on the 19th of August, 1874, by Mr. Thos. Stephenson, who was liberal contributor towards defraying the cost of the improvements carried out in 1871. Right top: 2nd St. Peter's as seen from Church St.
Bottom: The view as seen from the cemetery. The new church is now complete, and yesterday was consecrated by the Lord Bishop of Ripon. 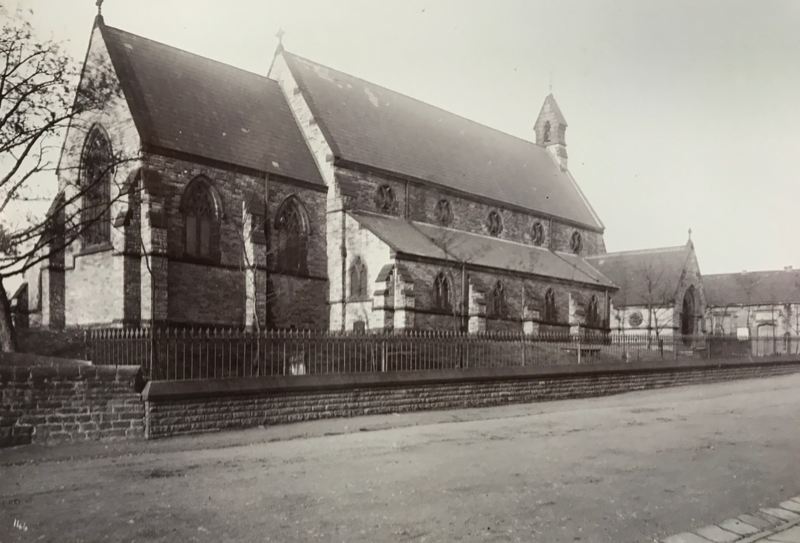 Designed by Messrs Adams & Kelly, architects, Leeds, who have given their services gratuitously, a handsome and spacious structure in the decorated Gothic style, has risen on the site of the old church, which in spite of recent renovation was unsightly and entirely devoid of architectural beauty. The building comprises a clerestoried nave, with north and south aisles and chancel. On the south side of the chancel is an organ chamber and vestry, beneath the latter being the heating chamber. The chancel is divided from the nave by a bold moulded chrucal [sic] (appears to be a typo as the arch in question is of gothic style) arch in two orders, the inner order resting upon corbel shafts, having moulded and carved caps and corbels. There are entrance porches on the north and south sides, and a separate entrance for the vestry. The roof Is open-timbered, with framed rafters; the floors are laid with tiles in geometric patterns; and the seats are open benches, with solid ends. The pulpit, font, communion table, and lectern are the gifts of private individuals. The church is built of stone, and will accommodate between 400 and 500 persons, the total cost being £4100. It is hoped at a future time a tower spire will be erected. which will form a place of public worship for the men of this generation, and not only for those, but which will be handed down, we trust, from generation to generation, for ages yet to come. This church has been erected at a very considerable cost. I understand there is still a debt on the building. There is nothing unusual in this, for it has very rarely been my lot to consecrate a church upon which there was no debt. But there is a debt to be met on this church of about £600. You have to face that difficulty; you have still to draw upon your resources for the liquidation of this debt; but you have great encouragement to do so, for I am told that through the liberality of one or two amongst you £250 of the debt will bo immediately discharged, if only the parishioners will rise in their liberality to meet the remainder. I would put this before you, and earnestly ask you to do your very best without delay to wipe off the remaining liabilities. Depend upon it, you will be no losers by what you give for the glory of God and the promotion of His honour. Money so spent is well spent is the best kind of investment, in that it will glorify God and tend to the salvation of souls and the extension of the Redeemer’s kingdom. It will return to you in spiritual blessings, which no money can purchase and arithmetic compute. Amongst the clergy present were the Rev, C. H. Gibson, vicar of Gildersome; Rev. 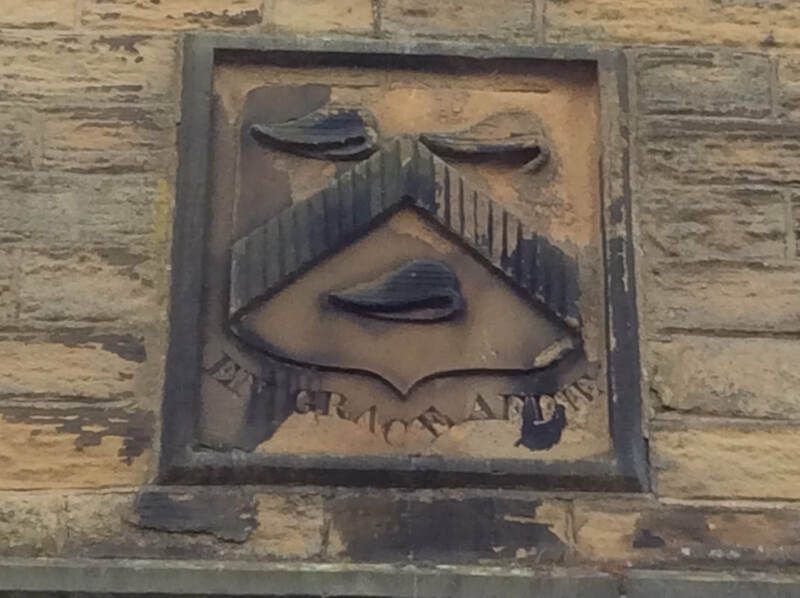 J. Earnshaw, Birkenshaw; Rev. J, Freeman, West Ardsley, Rev. C. Foster, Dudley Hill; and Rev. J. Crooks, curate, Morley, After the service, luncheon was served the schoolroom." note: values in Pounds unless marked. Afterwards destroyed by the fire. Cost of the New Vicarage to replace the Old one situated in a very unsuitable position at Nova.